It is hard to believe that we are two-thirds of the way through this year’s programme and that this will be the last newsletter of the 2014/15 season. The Royal Baroque concert on March 7th at Beeston Parish Church was a great success. Not only were both the singing and the instrumental playing of an exceptionally high calibre, but we also had an amazing audience with hardly any seats to spare. Thank you for your support. We are grateful to those who regularly attend our concerts but equally, it was wonderful to see so many new faces. Some had even come from the South of England!! 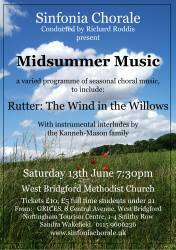 Our next concert “Midsummer Music” is at West Bridgford Methodist Church on Saturday, June 13th at 7.30pm. 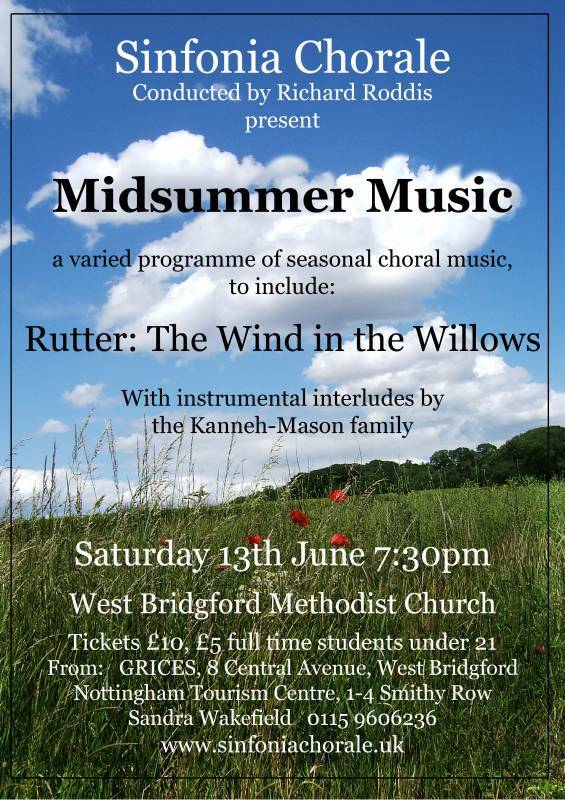 The programme is an eclectic mix, ranging from John Rutter’s “The Wind in the Willows” to the final chorus of Verdi’s great opera “Falstaff” with lots of interesting items in between. To add an instrumental dimension to the programme, we are delighted that four members of the talented Kanneh-Mason family are to be our guest artists. You may recall that in 2014 Sinfonia Chorale visited Germany to sing with the Bergedorfer Kammerchor. This was a most enjoyable trip and we are delighted that they are visiting us for a “Return Match”. They arrive on the 19th August and will be here until Sunday 23rd. They are performing two lunchtime concerts on their own, at 1.10 p.m. on Thursday 20th August in Lincoln Cathedral and at 12.15 p.m. in Southwell Minster on Friday 21st August. On Saturday August 22nd at 8.00 p.m. both choirs will join forces to perform in St. Barnabas Cathedral, Derby Road, Nottingham. We hope you will be able to come to support this event. Lastly, on Sunday, 19th July The Sinfonia Chorale are performing as part of a weekend of musical activities held at Patchings Arts centre. Further details of this and other events should be available on their website. We hope to welcome you to the remaining concerts in the season and thank you for your continuing support.